As manufacturers keep squeezing power on lubricants is being pushed to the extremes. 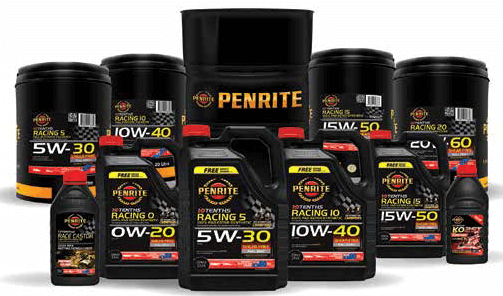 Penrite is no stranger to the performance lubricant market, and the 10 Tenths range encompasses the company’s long-standing ethos; the right oil for the right application. Originally developed as the flagship to the competition-vehicle lubricant range in the 1980s, the 10 Tenths range has grown into a market leading segment within the Penrite product family, built on price, performance and the vast range of application-specific lubricant options. With the backing of some of the biggest names, including Honda factory racing and the Erebus Supercars team, Penrite 10 Tenths has continued to dominate the highest levels of motorsport. 2017 saw the Penrite Erebus Racing Supercar cross the finish line in 1st place, powered by 10 Tenths Racing 5. What sets the range apart from other competition oils on the market is the unique 100 percent PAO ESTER formulations. PAO’s or Poly Alpha Olefins are part of the full synthetic Group IV base oils category. Esters fall into the Group V category and offer high film strength; critical when used in severe competition conditions. Penrite proudly promotes that a significant portion of the lineup is shear-free, which indicates the oil will not breakdown under extreme operating conditions. The FULL ZINC+ additive package places these oils around 1800+ PPM (Parts Per Millions), some of the highest numbers available. “Consumers have greater education about the products going into their vehicles, and the 10 Tenths range has been developed as a zero-compromise solution” said David Kirby, Marketing Manager for Penrite Oil. It is the product of choice for many competitors running competition vehicles in circuit and drag racing, rallying, drifting, hill climb, targa and time trial events. “It comes as a surprise to many that 10 Tenths Racing 5 is used in David Reynold’s Bathurst winning supercar,” Mr Kirby added. Penrite has continued to grow the product offering over time, with the most recent addition being Racing Zinc Top Treat. This engine oil additive is designed to reduce friction by up to 10 percent and improve the anti-wear properties of engine oils. In addition to the advanced additives, it contains a pre-balanced detergent inhibitor pack to maintain API SN/ACEA performance levels of modern engine oil. One 375ml bottle will boost zinc levels in 5 liters of engine oil by around 650 PPM. Importantly, the formulation has been developed for use with E10, E85, AvGas, Methanol and other competition specific fuels. Those vehicles destined only for the daily commute will also see benefits from the use of Zinc Top Treat, with greater fuel economy in on-road applications. To further the scope of the 10 Tenths range, Penrite has introduced Shift Eze a full synthetic gearbox and a differential additive that improves cold change performance and reduces wear, while extending the gearbox life.